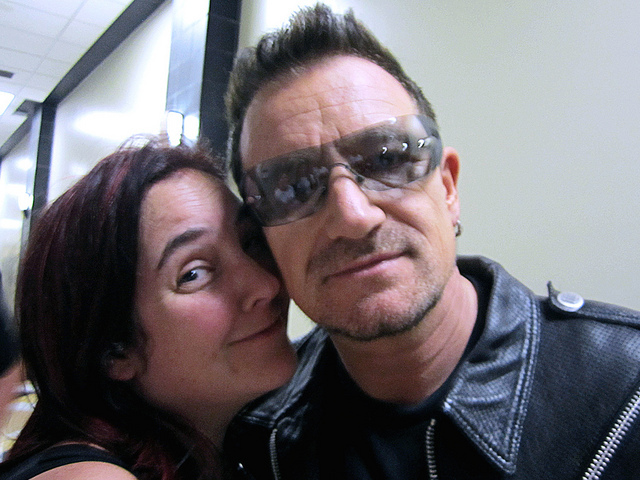 Today, Lara tells us how she met Bono, the U2 singer. In 2011, I was more than honored to be able to present the card to him in person along with four other members of AWF! The time leading up to the meeting was not without drama. We knew Bono himself had a finite amount of time before having to perform, and as we watched the minutes tick closer and closer to 8pm the five of us got quieter and quieter and more anxious. When we were led to the room Bono was in with other groups of people we sat and watched patiently, at first, as he took photos and talked with the others. This "little" man was larger than life - the aura surrounding him giving off electricity. It was like a caricature coming to life, however he looked exactly the same in person as he does in other media. Then Bono emerged through the door. Diane must've had similar thoughts because she just yelled at Bono "African Well Fund!" (No "we are", no "hello") . He swaggered Bono-style into our semi circle and said "I know who you are... I know exactly who you are... you're the ones who make my birthday every year!" and went over to Ally and put his arms around her as he began to tell us how much our fundraiser every year means to him and the band. How we inspire the band with what we've done and have proven that even a small group of people can enact change. That's when i chimed in "all it takes is some passion ... some hope ... and a big mouth..." and that's when he looked at me and said "I like big mouths" and that's also when I think he noticed the card I was holding and Ally might've given him a little push in my direction. He walked over to the card and I. Diane says "Lara makes your cards every year..." and he looked at me and said something like "really? they're great" and I asked him if he got all the cards we send and he said with confidence "yes!" which made me giggle a little bit. I handed him the card as he actually took a minute to look over the front of it and feel it a little! As he carefully unlatched the heart and opened it up he said "you're an artist..." which I don't think I've processed yet... my inspiration calling me a creator of art? oh my ... definitely not processed that yet... He also said "this reminds me of an american folk artist's work, I can't think of his name ... um ... He was a reverend ..." and then and there I KNEW who he was talking about! I put my hands on the front of his shoulders and said "I know EXACTLY who you're talking about but I can't think of his name either because I'm talking to Bono" which got a little laugh from everyone. 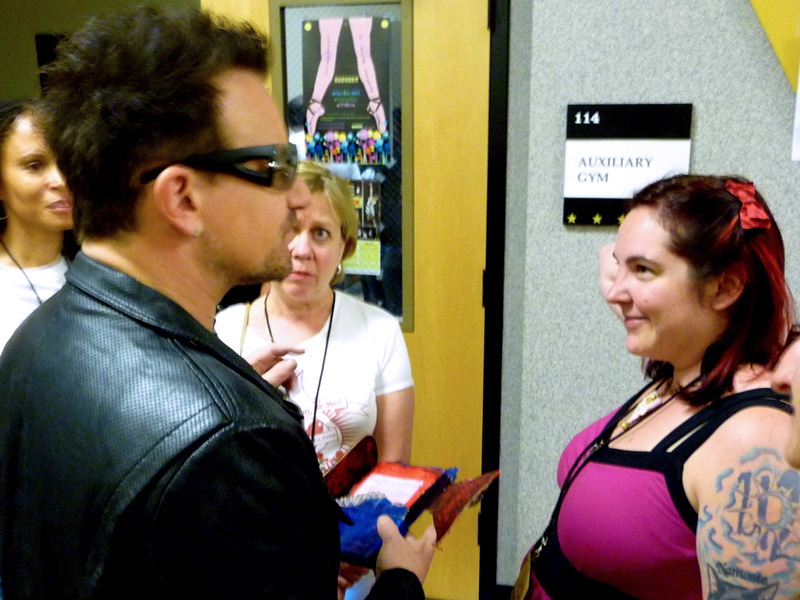 Then Bono returned his attention back to the card and started pulling out the announcement page. I started telling him that this year we raised $16,000 which is going to four girls schools in Benin. He then leaned forward excitedly and pressed his forehead against mine. (OMG). At this point his handlers were really pushing him to leave, it was 8:15pm and he was scheduled to go on at 8:45. They called the U2 photographer over who snapped a couple of photos and then they were pulling him away. But, being the audacious soul I am, I yelled "wait! i need a photo!" and he stopped for a moment, i pressed my face against his, put my camera in front of us and pressed the button praying that we were both in the frame, focused and eyes open. And that was it... He was gone on his way to perform an AMAZING live show in front of Nashville."